Fit-Ink: Ready to rock—and run—a Chicago Half Marathon? Forget the earbuds, the iPods and the prearranged playlists. 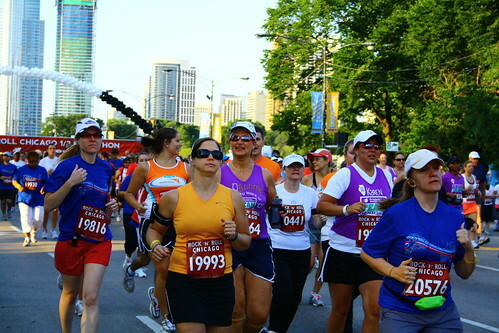 If you’re big on running half marathons, especially entertaining ones, and you’re looking to possibly PR on a course that’s flatter than most, then you won’t want to miss this summer’s XSport Fitness Rock ‘n’ Roll Chicago Half Marathon or the registration deal that ends March 31 (keep reading to see what I'm talking about). It’s on July 22, which for once doesn’t conflict with a Chicago area triathlon or the Air and Water Show or anything else that spells summer in the Windy City. It’s 13.1 miles that covers portions of the Bank of America Chicago Marathon’s course (albeit in the opposite direction at some points) and cruises along the Lakefront Path—provided the 2011 map holds semi-true for 2012. It’s filled with runners—and walkers—of all ages who range from your average joe to the people you watch, or watched, on TV regularly (like Al Roker, Giuliana Rancic, Dan Evans from The Biggest Loser and Kelly Bensimon from the Real Housewives of New York City to name a few). It’s filled with bands who’ll be performing at every mile, giving runners on-course entertainment and music to power through those miles. It culminates with a post-race concert that promises not to disappoint—Bret Michaels was the headliner last year. But if you want to participate in this Windy City favorite and not pay top dollar to run the streets you know all too well (that would be me), you want to register before the price increases on April 1. Register today or tomorrow for $85—or knock the price down to $75 by using this $10 off code from my friend the Running News Guy. Come Sunday, the $15 increase, making registration $100, isn’t a cruel April Fool’s joke. It’s real and the fees only increase from there: The $100 price is only good until the end of May until it goes up to $120 and then $150 at the race expo if registration is still open. That’s enough sticker shock to spur me into action sooner rather than later, even if race registration benefits the American Cancer Society and includes the race T-shirt, goodie bag, on-course amenities and post-race concert admission. For more details and to register, visit the Rock ‘n’ Roll Chicago Half Marathon website. ok, I just signed up before the price increase!! Let the training begin! Nice, Teresa! Will this be your first RnR? Good luck with the training and thanks for reading Fit-Ink!